With Buck gone, we all felt that we now had to find our dragonborn friend and try and find a way out of this horrid, accursed cave, and our only options were to open the remaining two doors in the room. Belarin took charge and opened the first and inside, we found the floor to be covered with diamond, and I saw the greed light up in Belarin's eyes, and I knew that this was all too easy, and Peregrine, being the merchant that he was, jumped up to examine the diamond to determine if it was real or not. Whilst Peregrine examined the diamond, I cautiously moved towards the back of the room and examined an ancient book sitting on a table and discovered that the any whom dare take the diamond will become it. I turned to tell the others to stop taking it, but was too late as I saw Peregrine writhing with the diamond beginning to cover his hand and expand up his arm to his wrist. After realizing what was happening, Belarin quickly emptied his bag of all the diamond he took and went to Peregrine but only made matters worse by covering his hand with gold which began to spread as well. I read more of the book and discovered that of the two chests in the room, one would free a person cursed from the diamond and the other, well, I’d rather not go into the details… Peregrine had already begun to break the diamond encasing his hand when Belarin moved to the wooden gold-rimmed chest and opened it to find a diamond knife, with which Peregrine was able to free himself from his diamond bindings and in the other chest I found a small ring at the mouth of a long tunnel, and the moment I moved the ring hundreds upon thousands of spiders began to crawl up the tunnel. 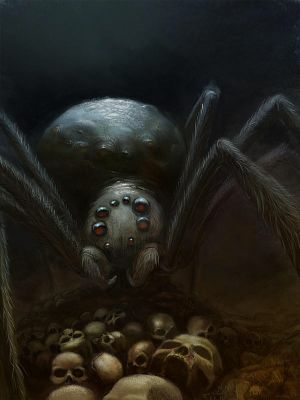 I shut the chest and sealed it, looked to my friends and we quickly left the room and shut the door, and since we knew the chest would not hold for long, I picked the lock to the last room and quietly opened it to find a gargantuan spider sleeping on the other side. Trapped by spiders on both ends, we were forced to advance forwards onto the spot where Buckles fell and with the combined strength of Borris, Peregrine, and Belarin, were able to open the giant iron door that stood before us. This racket woke the giant spider, and enraged, began to crash and scream and push itself through the cave wall to reach us. We fled forwards to find a small barracks in the cave guarded by 4 pirates whom attacked us, and with pirates ahead and spiders behind, we nimbly climbed the barracks wall and began to fight the pirates, and throughout the fight Belarin protected the girl we saved from before while laying waste to our foes. I was felled, but soon mended by the healing skills of Peregrine and Belarin, and awoke to find that they had already killed all but one of the pirates, and also found that the monstrous spider was upon us. The last of the pirates, named James, aided us to rid ourselves of the giant spider that had easily destroyed the barracks and was now advancing on us. James, Peregrine, Borris and I used our power to charge a mechanism that would create a force-field to ward off giant spiders living in the cave, and while Belarin distracted it, we were able to do so and the menace was sent reeling and screaming back to its hole. Safe for the moment, we all took some rest and then began to question the pirate James as to the whereabouts of Commodore Krogan, so that we may finish our mission, find Buck, and leave this hellhole for good.